The Issue of Female Priests! 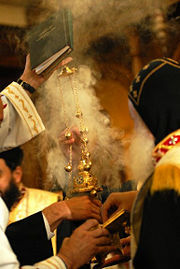 The Orthodox Church respects the natural order God created, i.e. the difference between male and female, for God created man and woman to compliment each other. Truly in Jesus Christ there is no man and woman (Galatians 3:28), for each of them is a member of the one body, having the same faith. Both are children of God through adoption, both are temples of God and the Holy Spirit dwells in them, both enjoyed the same spiritual duties and rights and both await the same eternal glory. However, man keeps his role as a man while woman keeps her role as a woman. It is one of the chief glories of human nature that men and women, although equal, are not interchangeable. The Fathers of the Church, having the biblical spirit, emphasized the equality of men and women while stressing the distinction between them. The distinction between male and female is part of the order of nature. Man is not preferred over woman; but the deeds of every person may put him first or last before God. In their deeds, they are equal, but in their properties and responsibilities, they are different. The church tradition does not minimize their capabilities or their effective role in the church. “The Woman” symbolizes “the church,” that is growing “to the measure of the stature of the fullness of Christ.” (Ephesians 4:13) Her role is vital because she is capable of giving birth to, and raising children, to prepare a bride for the heavenly Bridegroom. “Man” symbolizes “Christ” who is the head of the body and sacrificed His life on the cross. It is a fact that women were excluded from priesthood in the Old and New Testaments. It is evident that women in the Holy Bible were called for many responsibilities, but not priesthood. The first type of priesthood in the Old Testament was the priesthood of the great patriarchs of the church like Noah, Abraham, Isaac, and Jacob. The firstborn children who were sanctified to God were all men. The second type was the priesthood of Melchizedek. (Genesis 14; Hebrews 7) All of them were men. Then the Lord established the priesthood of Aaron and his sons, as the last one, when He said to Aaron, “Only you and your sons may serve as priests in connection with everything at the altar and inside the curtain. I am giving you the service of the priesthood as a gift. Anyone else who comes near the sanctuary must be put to death.” (Numbers 18:7) Among these examples of the Old Testament, there was not a single woman priest. Although our Lord Christ chose all male disciples and apostles, He allowed women to perform other services. Had any woman been worthy of priesthood, surely it would have been St. Mary, yet she was not a priestess and never claimed this role. Our Lord Jesus delivered the sacraments of the church to His disciples, and not to any woman. For example, He delivered the authority of priesthood only to the Apostles (John 20:21-23) and He gave the authority of baptizing and teaching to the disciples only. (Matthew 28:16-20) He did not call the women, although many of them were very holy and serving Him. (Luke 8:1-3) The sacrament of Eucharist was also given by the Lord to the eleven disciples following Judas’ departure. He said to them, “Do this in remembrance of Me.” He also appeared to them for forty days and spoke to them about all things concerning the kingdom of God. Preaching and teaching in the church’s liturgy is one of the duties of priesthood. Accordingly, women, as well as non-clergy men, are not allowed to teach others in church (1 Corinthians 14:34, 35; 1 Timothy 2:11-15). On the other hand, women are equal to men in prayer and practicing the sacraments as members in the one body of Christ. Of course, if God had wanted to call women for priesthood, He would have done so, in the same way as He called women to be prophetesses. Priesthood is not a matter of honor, but a type of daily sacrifice. The priest offers himself to die for the sake of the children of God. The equality of men and women is affirmed not by seeking ordination of women, for ordination is not an administrative position for attaining honor but for suffering daily death that does not concord with the feminist nature. His Holiness Pope Shenouda III says, “A bird may sing a sweet song on a tree and a lion may roar in the forest. If the bird tries to be a lion, it is not suitable. It is more beautiful for the bird, for the sparrow or the pigeon, to sing a sweet song and than to roar like a lion. And if the lion tries to sing like the bird it will not be acceptable. Let woman be in the service of woman, and man in the service of man.” Equality of women and men is not realized by masculinizing women but by discovering the dignity of their femininity. Bishop Kallistos Ware says that in the days of Jesus Christ there where pagan priestesses, and inspite of that, the Lord did not appoint a woman as an apostle. He asks: “Are we to assert that the incarnate Word and Wisdom of God was mistaken, and that we at the end of the twentieth century understand the truth better than He did? Female priests is not an issue! By saying that you are saying it is a problem. BUT it is not a problem, it is a Q. in regards to the role of women in church. In regards to Kerestina – While the issue may not be apparent in the Orthodox Church, even though the question has arisen several times, Christian Denominations such as the Anglicans and Catholics who allow women to give communion were the motivation behind this article. Stay tuned for the Role of Women Part 2 Tomorrow!